Gentleperson! After many weeks of tireful searching (Dad always complimented the large amount of quit in me), I have secured the perfect black wool full length overcoat. It's like a bathrobe, but Mrs. K. lets me where it to the store! Plus, I don't freeze my tuchus off on my PNW frigid wet porch/office/study/smoking den. It's perfect. An elaborate gold band and a sheath? I rubbed some extra oil in my hair for this pinkies up fancy occasion of an offering. The stick itself looks yummy as all get out. Veins are present but not an infringement on hand-feel or an impending threat as to burn. Complexion is uneven and extends from a milk chocolate with burnt sienna under-tones to an espresso bean hue sans undertones and of great depth. There is one odd vein, upon further examination, up by the cap. It's rigid and pops a seam up unevenly, but seems more a potential discomfort in my smoke-hole than construction woe. Cap itself is nicely affixed and foot tobacco is a matte finished monochromatic brick color -- it's packed to a medium+ density. Hand-feel is fine grit sandpaper via a slight tooth, but overall a smooth affair. Not a lot of oils or sheen. Packing according to a Charmin squeeze is medium+ with a lively spring in the slight sponge. There's a bit of a dent at first third's end. Schnoz notes at the shaft are dark ripe (natch) tobacco, cocoa, and chocolate. A woody note is added at the foot. Cold draw is very chocolaty on a nice and smooth medium draw. Some hardwoods are in the back there; out in the woodshed, as it were. Bit of a toasted sweet cream mouthfeel. Nice enough start. Hickory and seasoned oak float off the toasted foot with an underneath of cocoa beans. First hot pull is a buttery cedar thing which fades quickly into woodsy notes and a touch of cocoa. Actually, cedar fades quick...butter goes to cream and lasts throughout on a cushion of a mouth-feel. Second hot one is retro-haled and is a good bit more mellow than I'd bargained for. Seasoned oak and hickory are there, but there ain't a bomb in the building, praise Allah. Cocoa is there in a slightly greater strength. It all drops to my now cushioned palate. 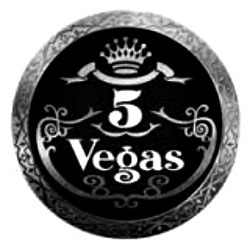 Quite calm, this 5 Vegas. Nice. A third hot pull has all that and a vibe of suede to it underneath. As the finish comes in, mouth crisps up on the bracing woodiness. Ash is bright white and attempting a sheath. Burn is wavy off a wooden match porch-light. Its line is razor sharp thin. Packing throughout has loosened a tick, but evenly. Draw is still a medium, but at a lower end than at its onset, and we're still at its onset. Very woody, cocoa subtleties, toasted cream mouth. Medium profile, although strength has yet to flex, I bet. Smoke out-put is a average, room-note is sweet seasoned woods. Quite mellow of an offering -- a surprise of the pleasant variety, that. Still, there is something of a vibe on the horizon, I think...perhaps charcoal? For now, it is what it is and I yam what I yam. Which ain't bad at all, on each account. Sheath fails into ladder-rungs, but bright white ash looks pretty anyways. Burn has evened and line remains on a razor. Draw and packing have each ceased down-ticking. A sharper note is in now and has dried my mouth some -- a mesquite. More wood. A scrap of meat is here and there. Beef jerky. It tickles the ol' umami sense, but doesn't fully satiate a red meat lust. A lust I don't have, so we good. I eat a burger or a steak, sick for a week. Ash clumps off at an inch all on its lonesome and shows itself to be surprisingly airy. Later on now, I'm at the end of the first act, and there's a bit of a bitey pepper remnant from the now gone jerky. Woods have seasoned in the same shed and begin to marry a tad. Cocoa almost fades but now revamps to a higher plateau than prior. A loose ripe compost barnyard thing carries it all. A very finely ground and slight trace of black pepper comes on the retro-hale. It's a sauteed thing. Finish is -medium length'd and an uncluttered barnyard with some hint of ripe sweetness. Mouth-feel has a lightened cushion via thinning of cream. A bit of a dark bread note comes in. As the midpoint somewhat approaches, meatiness comes back in on a charcoal note. Sweetness is now solely inherent in the 5's Maduro nature. Palate is crisped by woods. Tongue is a slight tingle of kind and only on the retro-hale black pepper. Not a lot of delineation. More strength now, as it's up to a stronger medium. I'd say that too, is the across the board profile. All notes toward construction hold. Ash is rebuilding as a replica of its prior self. Notes are ripening, but it leads to a bit of mottling instead of complexity. Now at the half, I sense some dark fruits, but as a vibe, not note. Cocoa is nice. A bit of cream returns. More pepper on the retro. Woods have married into a seasoned hardwood note. Meats leave again. Charcoal stays, muted. Fruits stop trying as they are lost in cream as it toasts. Post transition/midpoint -- smoke out-put ramps up a notch to the same room-notes. Mellow, with balls, is how I'd describe this Series A. Strength ups. Flavors, while not fully bordered, heighten. The returning cream adds body the longer it hangs around. Medium+ profile. Somewhat chewy mouth. Post-draw and through finish, there is a rye malt note. Finish is a tick lengthened but not overly hearty. Compost barn backing has picked up a higher earthy partner. The earth note toes the line between backing and full-on note. A leather note interjects. Woody notes somewhat surprisingly and all of a sudden, leave. Earth soars. Cocoa fades and ebbs/flows. Meats stay gone. Charcoal is a vibe. Cream thins. Pepper is a hint. Very, very calmly earthy. Some coffee beans come aboard. A smokiness hits the compost. Construction holds, as does draw. Ash flakes a tad more, but nothing terrible. Everything settles down and smolders. I get the feeling of a campfire allowed to slowly burn out unattended. Strength ups a good tick and I put some sugar on my no longer tingly tongue. At the band, smoke stays coolly warm and woods come back sharply with a black bread underneath. Coffee beans are ground and brewed. Sweet no longer, but mellow and simple in a nice sort of way. A fairly textbook take on Maduro. I am not a fan of most Maduro offerings. I will say this wasn't as bogged down as many, so far as flavor, but I got a bit of a feeling like the notes were getting in each other's way. Nevertheless and in the interest of fairness, I shall then stick to less subjective meanderings such as construction. Construction was mighty fine. Less subjectively was the pretty enough ash. Concord Grape of Blackberry Manischewitz would tease out or infuse more fruitiness. Grain alcohol. Coffee, Cola. A pip of Hershey's. In case you were wondering, gentlepersons. Fans of Maduro won't be disappointed if they were to scoot over to my pals a CIGARS CITY to buy this offering. Also, be certain, please, to attend our Radio Herf.